The book catalogues and compares trends which pervade the Botanical hierachy of families, orders and entire clades and places them into stage tables which are based of the previous work of Dr. Scolten (stages) and Dr. Sankaran (miasms). In this book I unearth aspects of psychology which can enrich the stage concept with various perspectives and methods, such cluster analysis which have the potential to provide a more quantitative evaluation. This means that the stage concept can be applied to any remedy or case. Another challenge, implicit in any Botanical study of Materia Medica is to integrate any causal relationships between the evolution of botanical function of each of these groups and the sypmtoms they produce into the remedy pictures. Stephanie Nile is amongst scientists, researchers, academics and practitioners at the forefront of modern Homeopathic science. Thanks to her broad interest, natural curiosity and profound knowledge of the natural Sciences, she dares to present new and colourful insights into the relationship between plant remedies. - Rumen Stoychev, HomeoHelp This is the time for developing homeopathic studies which organize all previous approaches to Homeopathy. Her natural powers of intuition and synthesis make her work a very good example of this tendancy. My dear Stephanie, In the name of all Homeopath's thanks so much for your excellent work, which for sure, is going to help the whole Homeopathic community. - Jose Mirilli, author of The Thematic Repertory. The Mineral Kingdom has its periodic table and the Plant Kingdom has been subject to classifiÂ­cation since the days of Linnaeus, at least. Both provide a structure within which we, as homeoÂ­paths, can look for group characteristics. Rajan Sankaran looked to Sensations as the unifying factors in plant families (as defined by Cronquist); he further narrows the field of choice fey fitting individual remedies into his Miasms, which bring their own characteristics and represent the depth and pace of the remeÂ­dies both in the plant and mineral world. Jan Scholten sees each series of elements in the periodic table as representing the 'subject' of an allegorical sentence or the 'I'. Scholten, of course, uses Stages for the purpose of further identifying the individual element. His Stages represent the 'verb' or coping strategies for the challenges faced in the journey of life; the mineral salts are the 'object' or sphere of outcome where there is an integral need for bonding in the component elements. He is now working on bringing the Plant Kingdom (with the more modern APG genetics-based classifications) into his overall structure of Series and Stages. As far as miasms go, he broadly divides the 18 Stages into three parts, reflecting Psora, Sycosis and Syphilis, which he defines in the traditional way as well as tying them in with an extended version of Sankaran's Miasms. 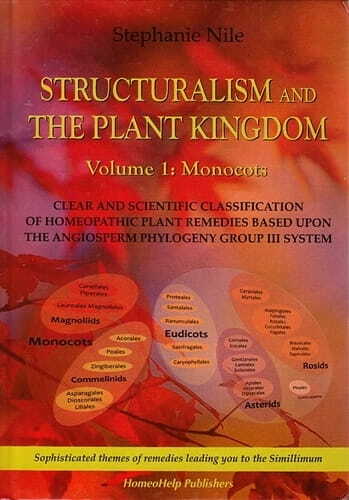 Stephanie Nile's aim is to integrate these approaches in a new Plant materia medica that shows, in this volume, common themes of the Monocot clade and its orders and families, describing coping strategies and outcomes with links to Stages and mineral remedies but also to Sankaran's Miasms which theoretically slot neatly into the Stages. I remained a bit unconvinced by this in practice but the rationÂ­ale is all here. The first part of the book comprises of a wide-ranging philosophical discussion of the reasonsnfor looking to this kind of (nomothetic) classification approach in general as opposed to the more tradional (idiopathic) approach which starts with the whole picture of the individual. She utilises models from conventional psychology, as well referring to Buddhist tenets, to propose the universality and truth of the stages and says we shouldbe looking for structure in plant families as in the Mineral Kingdom even though with plants we will be looking at a 'psychological dimension (which) is competitive, reactive and sensitive' as opposed to a 'psychological dimension based on values and power'. Thus Bambusa arundinacea is ascribed to the tubercular miasm, and comparisons are made with the Stage 6 remedies in the Ferrum, Silver, Gold and Lanthanide Series; we are ultiÂ­mately guided to the mineral-salt combination of Neodymium bromatum. The weakness found in Avena sativa, however, takes us to Stage 14 in the Ferrum, Silver and Lanthanide Series. Links with the Lanthanides figure large in Nile's work; she sees the Lanthanide salts as the remedies of our times and, where appropriate, as often bringing more depth to the outcome of successful 'Plant' cases. In prescribing we would have arrived in the first place at the Poales (Graminae) order, of which Bambusa a is a member, through the themes and sensations associated with it and the Commelinid clade. The orders in the Commelinid clade also correspond to the Series of elements with the Alismatales (induciÂ­ng the Arums) corresponding to the Carbon Series, Poales and Zingiberales to the Ferrum Series in the main and Aparagales and Liliales to the Silver (and to some extent) the Gold Series. The Magnolid Clade has more affinity with the Silica Series. These relationships are described and represented in a variety of charts and diagrams. I attended a seminar with Jan Scholten where he had his own way of explaining how he was trying to fit species into a periodic table of the plant world. Stephanie Nile's explanation is easier to follow and, although not all remedies have found their place in this scheme, where they have done so, it is much clearer why they have. So in one chart Cypripedium finds itself at Stage 6 in the Silver/Aparagales row and it is possible to see simiÂ­larities with Molybden which is in that place in the periodic table. Interestingly, in her materia medica Kali brom and Zinc are described as Cypripedium's 'similars', as in Clarke's Dictionary presumably, a seeming paradox which she does not attempt to explain. This leads me to the grumbles. The book is absolutely full of printers' typos and layout glitches and for a self-styled 'academic work' the referencing is very poor. Not only is the materia medica generally not sourced - imporÂ­tant if the reader is trying to check out the provenance of descriptions of remedies - but where a reference is given it is just a name; in one case just 'Massimo says...' We can probably guess the identity of 'Massimo' but there is no indication of where it was said or written, or the context. In an academic work every quotation should be sourced - that is what footnotes and endnotes are for and what an editor is for, too. If everything had been referenced properly the fact that Gymea Lily and Paw Paw are not actually Bach Flower Essences might even have been spotted. The use of abbreviations was irritating too. It might be fairly easy to work out what DT and P.T.S.D. (sic) stand for but DD, REBT or DSM or GLBT or ADAH? When we realised, rather belatedly, that the whole book is a printout of an interactive website it all began to make sense. Add 'cut and paste' to Bulgarian printers working with English text and it is easy to see how sentences might get truncated and a double page diagram get split and separated by several pages, quite apart from the typos and misspellings. Not only has the book been produced on the cheap but it also probably had to be, as the material has been generously and freely made available online. Even looking up abbreviations would, I suppose, be less irritatÂ­ing if you were online already (although I never did work out what ADAH was). Furthermore -and here's a strange thing - I found myself feeling much more tolerant of the poor referencing. Why on earth was that? Is it that we have got used to expecting much higher standards in the printed word? Or much lower standards from websites? This book is the first of a series and the second is well under way, apparently. The quality and quantity of work involved in this exercise deserve better. I don't really want to end on too negative a note: Stephanie Nile's contribution to current developments is original and valuable. The philosophical rationale behind the project is especially well thought out and interesting. She is providing a basis for a new integrated mateÂ­ria medica - something which, I am sure, will be built upon and developed further over the next few years. I look forward to reading what is to come. The Angiosperm Phylogeny Group, or APG is an informal international group of systematic botanists trying to establish consensus on the taxonomy of flowering plants (angiosperms) to reflect new knowledge about their relationships based upon phylogenetic studies. Carl Linnaeus (23 May 1707 - 10 January 1778), also known after his ennoblement as Carl von Linne was a Swedish botanist, physician, and zoologist, who laid the founÂ­dations for the modern scheme of binomial nomenclature. He is known as the father of modern taxonomy and one of the fathers of modern ecology. A clade is a group consisting of an organÂ­ism and all its descendants. In the terms of biological systematics, a clade is a single 'branch' on the â€˜tree of life'. This 'natural grouping' of organisms and giving a taxo-nomic name is central to biological classifiÂ­cation. In cladistics (which takes its name from the term), clades are the only acceptÂ­able units. The term was coined in 1958 by English biologist Julian Huxley. I am not sure how Stephanie Nile has managed to condense such a wealth of information into such a small volume, but condense it she has, with the end result being a packed little book bursting with ideas. However, I fear that there is a little too much going on and at times it is tough going to keep up with the different concepts and theories, pulled in not just from the world of homeopathy, but also from botany, psychology and Eastern philosophy. Promised in this first volume, focusing on the monocots, is a combination of the work of Dr Rajan Sankaran and Dr Jan Scholten, offering us a way of better understanding the plant kingdom. Nile says in the book's introduction that "homeopathy needs to be mapped onto a contemporary landscape". What the author does is to take a step back from Sankaran's work with families to look at the bigger picture - where the family fits into the classification system within the plant kingdom, and how their evolutionary struggle for adaptation has influenced the picture. The next step is to apply the concept of "stages", as set out by Scholten on the periodic table of the elements, using the metaphor of the life stages of development from birth to death. Nile suggests that the "miasms" as suggested by Sankaran fit "naturally" into Scholten's stages. Converting them, she says is "like converting Fahrenheit and centigrade...it requires a bit of jiggery pokery." It's a fascinating and challenging idea. Nile, a zoologist who describes herself as "first and foremost a systems analyst" has put together a well researched book with a neat "periodic table" at the back, suggesting how the monocot plants compare to the minerals. Her materia medica brings together a variety of information, many of the remedies little known, and suggests similarities with the minerals in the corresponding stages and rows. The summary and epilogue give a good brief overview of the sensations and themes of the classification hierarchies, but I would suggest that readers study this before looking at the individual remedies. While overall I found this book useful, and I am sure I will dip into it again, I found much of it confusing and difficult to understand. For me, the inclusion of the discussions of psychology and the "types" didn't seem to be relevant to the structure/sensation approach and the model being put forward and added to the confusion. Perhaps my uneasiness with this book lies in the apparent juxtaposition of these two approaches - while it was fascinating to look at plants in this way, and attempt to make our job at pinpointing the precise remedy easier and to understand how mineral and plant remedies can complement each other, I wonder whether the very nature of plants makes it impossible to squeeze them into the periodic table. While great work has been done by both Sankaran and Scholten, their approaches are different, and for me, overlapping them in this way didn't quite work.